As you can see from the first picture the stone protrudes beyond the bottom of the bezel, so come time to push over the bezel it is going to be awkward, as you will not be able to put it on a flat surface to push against your block or whatever you use normally. This is where the wax helps enormously. This second picture shows some wax I have been using for a while which has been gently heated with a feathery flame ready to take the piece. You want it to just melt, so a moving flame at a distance works best as it will catch fire, spit and hiss if you get too close or too hot. In the third picture I have place the piece onto the softened wax with tweezers, it has cooled slightly but is still very plastic and having dropped the piece onto the wax you can then push it into the wax with your finger so that the stone is still in its seat and the whole piece is pushed down into the wax. I did not push it in as far as I would if I were going to be then doing the rub over, as I wanted to get it out without damaging the imprint the piece has made in the wax so you can see how well it moulds into place. When doing it for real you would thoroughly embed the piece so all sides are neatly enclosed. The wax, is firmly stuck to the coarse wood and once positioned your piece is held firmly in place and protected by the wax, which sets rock hard, so even bails or wirework you have already soldered to the piece will not be distorted. I have read, a sawn off broom handle is very good as it gives you something to hold onto while pushing against your bench block etc. I use this length of wood as I find I can fix it in my vice or use it in my hand and push against the bench as needed. Cooling can be hastened with cold water but i have never found this to be necessary. Once you have finished setting, you can remove the piece by gently tapping the wax till it shatters thereby releasing the piece or you can gently warm it again to be able to dig the piece out, though this leaves more residue of wax. Clean up is simple, acetone removes all traces of wax with very little effort. 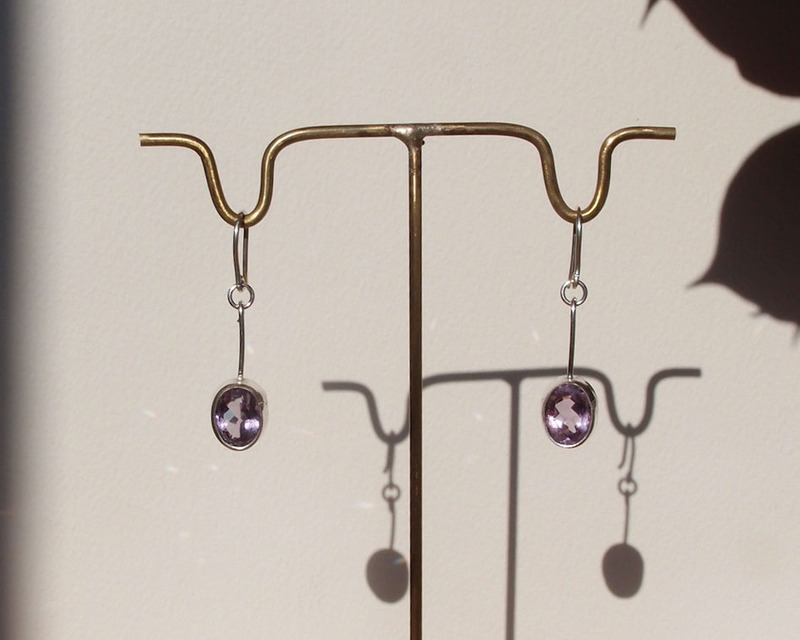 Of course this method is not restricted to just bezel setting, it can be used for all sorts of things where the shape is awkward to hold while doing other things, with no damage to the work you have already done. Addenda: From time to time this will happen :0) see pic below, usually it does not but as it did for me today it allows me to say DONT PANIC. Liberal application of acetone with a piece of kitchen roll took this out in less than five minutes. I used a tiny glass bowl I have to dip it in then just wiped with the tissue till it had all disintegrated. This happened because I reheated to reposition and then pushed it back in again forcing the wax too deep in the back of the setting. 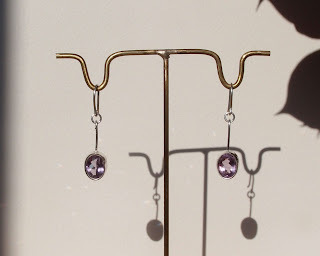 As you can see no harm was done and here are the amethyst earrings I was making for my mum. Note: all pics will enlarge for better viewing if clicked on. that's very neat, it almost looks like doping wax that I use to work on stones. I am pretty sure that is what it is called if you buy it from the likes of Otto Frei, dopping wax. Here in Europe it goes under the name of setters wax or setters cement.